With the purchase of this product, you will gain access to following for 2 months, Unlimited attempts. For Better Result: As we offer unlimited attempt of SAS Certified Advanced Programmer Practice exam - A00-212, we recommend strongly to practice as much as possible before your actual exam. Your continues practice helps you to score outstanding in your actual A00-212 exam. 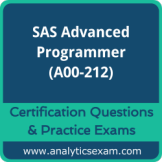 Premium SAS Certified Advanced Programmer Questions bank contains 385+ questions, and Premium Practice Exam will populate questions randomly from this question bank. All the questions from premium question bank will be covered easily in 4 to 6 practice exam attempts. There are currently 49 users and 343 guests online.